Making form follow function (or, getting your house to suit your passions). Does it ever seem as if our lives are guided by a set of flukes? 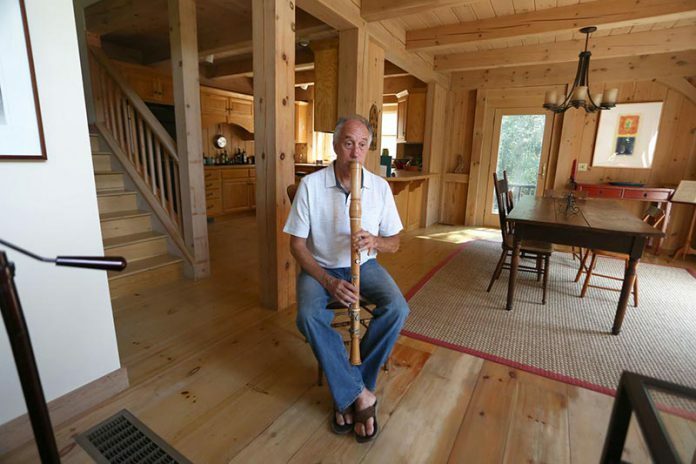 A couple of years ago, Ed Merck, retired entrepreneur, musician, sailor, and author, could never have foreseen that in these early blue-and-gold days of September 2015, he’d be standing with his Renaissance alto recorder under the chapel-like ceiling of his house in West Tisbury, lofting perfect notes to resonate against high pine beams. 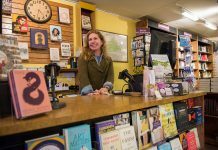 Rewind a few years back to a saga rich with adventure: In the spring of 2009, Ed, freshly retired and divorced, his son Evan off to college, made a conscious plan not to go gently into that golf-and-afternoon-naptime phase of our senior years. Instead, he had this nutty plan of figuring out what the heck our lives are all about. 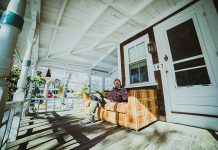 To this end, he sold his gorgeous, light-filled, minimally furnished house in Foster, R.I., and, just as the Roy Scheider’s police chief suggests in Jaws, bought himself a bigger boat. He knew at a gut level he wasn’t about to find deeper meaning by sailing it solely on the weekends. No, he would live aboard and troll the Eastern Seaboard until a spiritual awakening tapped him on the shoulder. But there’s more to the story, which is rich with shore leaves to pick up Evan, also an avid sailor, and later a woman of mystery and with a bit of a torrid temper. All — or much — is revealed in Ed’s 2013 memoir, Sailing the Mystery: My Journey Into Life’s Remaining Chapters. Ed saw it. He loved it, but first he needed to test out his musical instruments within its walls. The acoustics were sublime. Two weeks later, he signed the purchase and sales agreement. On April 7, 2013, he moved in. Off Lambert’s Cove Road, the house had been built in ’94, and visited infrequently by a couple from Cincinnati. It sits on a tract of dales and woods that backs up into a Land Bank property, giving it a feel of Winnie-the-Pooh’s Hundred Acre Wood. A contemporary with two high stories, its windows stack up on each other, with a sprinkling of half-circle windows to imbue the rooms with still more light; the house is radiant and posh without verging on the Trophy. 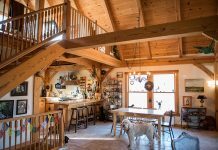 Ed says, “I needed a home that felt protected and quiet and yet at the same time connected to nature.” The house, “as is,” was pretty much perfect, but Ed longed to mold the living room into an area for intimate gatherings. To that end he hired his architect friend, Frank DiMauro, to carve out a hearth into which a soapstone-topped wood-burning stove was installed. Above, a mahogany mantle with Asian-accented fluted ends adds grace and definition. Mr. DiMauro’s wife, decorator Holly DiMauro, helped Ed with his Zen-leaning aesthetic tastes, to wash the canvas of his rooms with beige, gray, and raw pine tones, here and there offset with a hint of color, as in Island artist Marie-Louise Rouff’s oil painting of orange and blue squares rimmed by yellow, with pride of place in a corner of the dining area. As we sat at Ed’s antique farmhouse-style dining table — one of the few pieces carried over from his Rhode Island life, and this because Evan said, “I really like that table, Dad” — I asked if the crazy experiment of moving here, virtually on a whim, worked out for him. Meanwhile, he’s not merely a musician, a meditator, a writer, nor a tinker and a sailor (well, he’s still that). He also chops his own wood, and now it’s piled to the brim in a capacious open storage shed to the rear of the house (which he heats solely with the use of his wood stove). It should be a glorious second winter for this man who sails the mystery.